Summer is almost here and as work and school wind down and Yarra Valley Water customers spend more time at home, some simple tips will help customers save water and money this summer. A study of daily water usage habits revealed that Yarra Valley Water customers in Melbourne’s east and north used 190 litres of water per person per day on average last summer. This is compared to 151 litres across the remaining nine months. 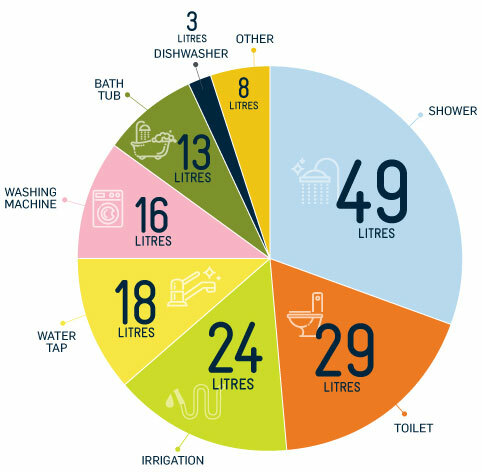 The shower, the toilet and garden irrigation are the biggest water guzzlers in Yarra Valley Water households, using on average 49, 29 and 24 litres of water respectively per person per day. Yarra Valley Water’s Managing Director, Pat McCafferty said that summer is the best time for Yarra Valley Water customers to adopt habits that will save them both water and money. “We often see a spike in water bills over summer as the combination of hot and dry weather, school holidays and time off work, means people are using more water inside the home and in the garden. “Households make up most of Melbourne’s water use, so saving water at home has a big impact on our water supplies as well as on your water bill. It doesn’t have to be difficult, a few small tweaks can make a big difference,” Mr McCafferty said. Shorter showers – Most household water-use happens in the shower. For example, reducing your showers from seven minutes to six minutes per day will save Yarra Valley Water customers 3,000 litres of water per person per year. Even cutting 30 seconds from your shower will make a difference. Wash a full load – Fill your washing machine to capacity before every cycle. Make sure you select size-appropriate cycles and skip the extra rinse cycle. Change when you water – Watering your garden either at night or in the earlier hours of the morning allows the water to seep into the soil instead of being evaporated by strong sun. Also check the soil to avoid over-watering. If it’s damp, it probably doesn’t need watering. Use a trigger nozzle – A trigger nozzle will save water because you can instantly turn off water between watering plants or washing different parts of your car. Fix a leaking tap – Fixing a leaking tap sure adds up. It could save you 16,000 litres per household per year. Purchase a front load washing machine – When you’re next in the market for a new washing machine, consider a front loader. It could save you 15,000 litres per household per year. Replace single flush with dual flush toilets – Making the switch could save you 35,000 litres per household per year.